C&R Technologies® provides a suite of tools that can handle all of your heat transfer and fluid flow modeling problems. 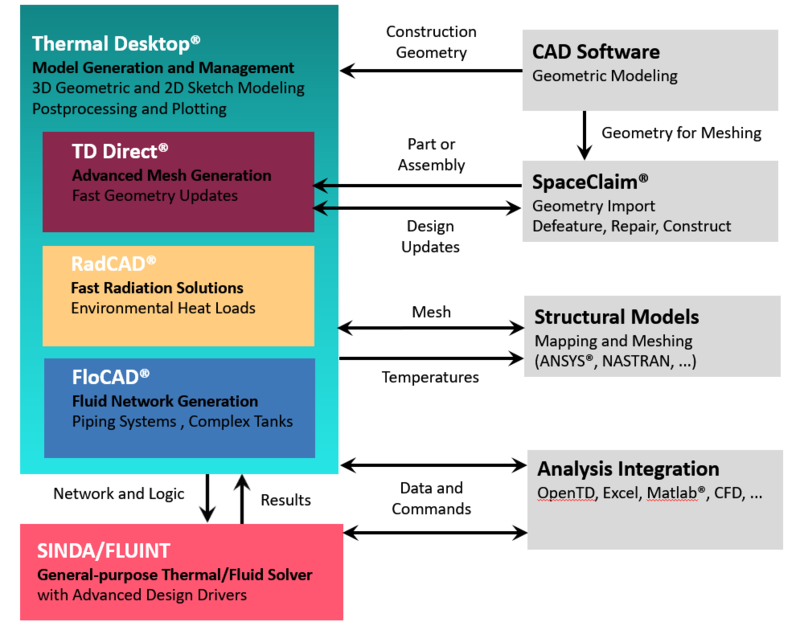 Built on top of our core solving engine, SINDA/FLUINT, we provide geometric (Thermal Desktop®, FloCAD®, RadCAD®, and SINDA/FLUINT) or nongeometric (Sinaps® and SINDA/FLUINT) GUI tools that can help you build and analyze any system. Review our Product Selection Matrix and Getting Started Guide for assistance in selecting the products which best meet your needs. All of our products are available for free evaluation. We are dedicated to producing software tools that not only help heat transfer and fluid flow design engineers produce analytical answers, but also product solutions. Regardless of which GUI tool suite you select, you can apply advanced techniques that transcend traditional steady-state and transient simulations into the realm of design optimization and statistical analyses. CRTech also offers the most comprehensive two-phase thermohydraulic analyzer available. SINDA/FLUINT is a comprehensive finite-difference, finite element, lumped parameter (circuit or network analogy) tool for analyzing complex heat transfer and fluid flow systems. Thermal Desktop is a PC based thermal model builder with a built-in mesher. Thermal Desktop incorporates both familiar parameter based finite difference surfaces with finite elements using CAD technology to model heat transfer in a system. Thermal Desktop develops the capacitance and conductance network for input to SINDA/FLUINT. Additionally Thermal Desktop provides capabilities such as applying contact conductance, insulation, heat loads, and heaters. TD Direct is an add-on module for Thermal Desktop providing a bi-directional port to SpaceClaim, enhancing the CAD preparation and model maintenance processes. Analysts can extend the CAD preparation features in SpaceClaim by meshing surfaces and solids during import into Thermal Desktop, tag surfaces for heat loads, contact conductance, convection, and easily update the mesh if the part geometry changes. Sinaps has been deprecated. FloCAD now provides a superset of Sinaps non-geometric modeling features, including geometric options. Existing Sinaps models can now be exported to Thermal Deskop and FloCAD. Please contact CRTech for more information.